Once you have placed your order, you will receive an ORDER CONFIRMATION sent to the email address you have provided. As soon as you place your order, you will receive an email confirming your order. Your order is now in the AWAITING FULLFILLMENT STAGE. It will remain AWAITING FULFILLMENT until it ships. Please remember that custom work does take longer to ship out. 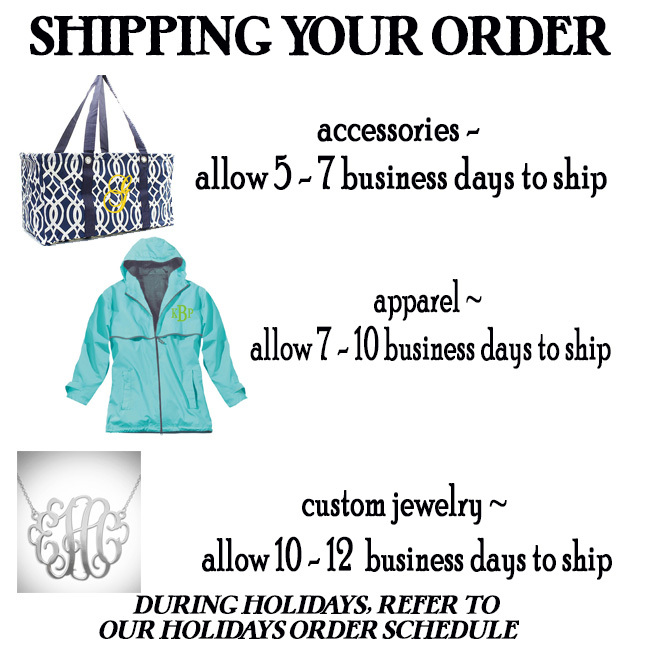 Check our order processing details for time to allow for your order to ship. Once your order is completed and shipped, you will be sent an email CONFIRMING THE SHIPMENT ALONG WITH TRACKING INFORMATION. We will ship Priority Mail or UPS, depending upon the weight of the package. All orders will be inspected and packed carefully, and tracking number can be supplied. 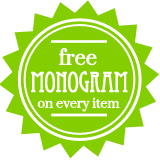 Please note: if your order requires no monogramming, it will be shipped within our processing times listed above. To RUSH the processing of your order, go HERE.